Meeting the demands of modern lean manufacturing environments requires smaller more flexible machinery. Digitax ST is the first ever drive designed to help machine designers and system integrators meet these challenges; optimized for servo applications requiring high peak torque, dynamic response, ease of use and flexible integration features. Four product variants ensure that the drive's personality perfectly matches your servo applications. Optimized for centralized control, to operate with motion controllers, motion PLCs and industrial PC based motion systems using a wide range of digital or analogue interface technologies. Designed for simple standalone positioning applications using an onboard position controller. Fieldbus, Ethernet and IO enable connectivity to other automation components. This drive offers a stand alone solution for many common indexing and synchronized motion applications. 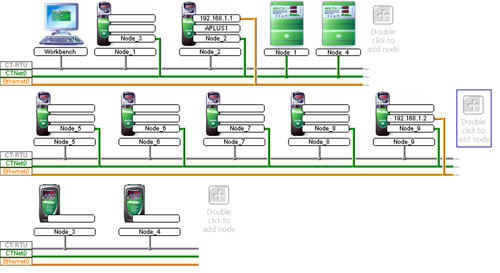 This is achieved using a unique PC programming interface that guides the user through the drive, I/O and motion configuration. Features a full functionality motion controller, optimized for high performance machine cells requiring drive-to-drive networking and precision synchronization. The motion and communications are configured within a flexible IEC61131-3 software development environment using PLC open function blocks. Fieldbus, Ethernet and I/O connectivity enable interfacing with other automation components and intellectual property protection ensures that your valuable knowledge remains secure. Our Software makes it easy to access the drives features; it allows you to quickly setup the drive, optimize the tuning, back-up the configuration, program the onboard motion controller and setup communications links. The Software tools communicate using Ethernet, CTNet, Serial or USB connections. Ethernet allows the software tools to easily use the internet infrastructure allowing Control Techniques drives to be accessed remotely, from virtually anywhere around the world. 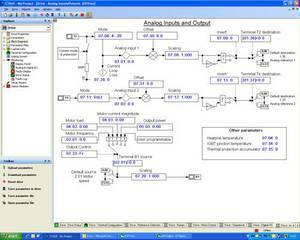 Digitax ST - index motion controller is programmed within CTSoft using industry standard Sequential Function Chart (SFC) language. The user can quickly configure a range of motion commands such as homing and various index moves. The focus is on reducing development time and ease of use. 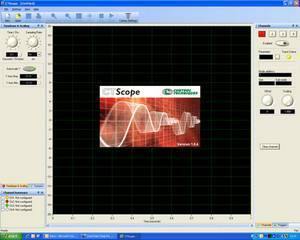 CTScope is a full featured software oscilloscope for viewing and analyzing changing values within the drive. The time base can be set to give high speed capture for tuning or intermittent capture for longer term trends. The interface is based on a traditional oscilloscope, making it familiar to engineers across the globe. 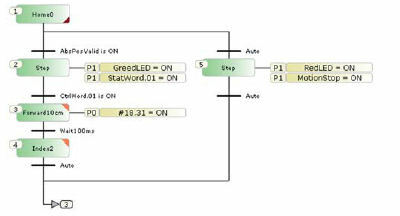 SyPTLite is an easy to use ladder logic program editor, suitable for simple drive applications. SyPTLite is ideal for controlling basic logic and sequencing with Commander SK and Unidrive SP onboard PLC and with SM-Applications Lite option module. SyPTPro is a full featured automation development environment that can be used for creating solutions to single or multiple drive applications. The programming environment fully supports three industry standard programming languages: Function Block, Ladder and Structured Text. 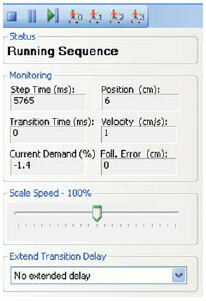 Motion is configured using PLC open function blocks that support a master and slave axis configuration. SyPTPro is also used to configure CTNet - a high speed drive-to-drive network links together multiple drives, SCADA, operator panels and I/O to form an intelligent networked system. CTOPCServer is an OPC compliant server that allows PCs to communicate with Control Techniques drives. The server supports communication using Ethernet, CTNet, Serial RS485 and USB. OPC is a standard interface on SCADA packages and is widely supported within Microsoft products. A wide range of option modules are available to allow you to customize Digitax ST for your application. Ethernet option module supporting Ethernet/IP and Modbus with built in web server.